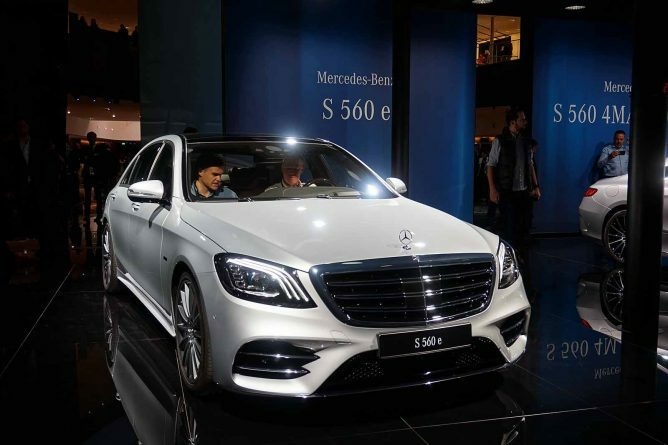 The third generation of the Mercedes-Benz S 560 e (combined fuel consumption: 2.6-2.5 l/100 km, combined CO2 emissions: 59-57 g/km, combined electrical consumption: 20.2-20.0 kWh/100 km) is now available for order priced from 96,065 euro. In the luxury saloon – available exclusively with a long wheelbase (V 222) – the efficiency of the 9G-TRONIC plug-in-hybrid transmission and a new lithium-ion battery are good for an all-electric range of around 50 kilometres. The hybrid drive system in the S 560 e combines the 270 kW (367 hp) of the V6 petrol engine with 90 kW of EQ Power to deliver a maximum system output of up to 350 kW. The highly efficient battery system in the S-Class comes, for the first time, from the wholly owned Daimler subsidiary Deutsche ACCUMOTIVE. The DC/DC converter previously housed separately in the luggage compartment is now installed in the power electronics housing. Despite an increase of around 50 percent in its energy content, the dimensions of the new battery are smaller than those of its predecessor.